One of the greatest voices of the 21st century that should not go unheard. She sings uncompromisingly, unapolegetically soulful, smooth, blues with a feeling. A veteran performer, Ruby is headlining shows all around the USA and recently appeared on shows with international artists such as, James Cotton (former harp player for Muddy Waters) Vernon Garrett, Ray, Goodman, & Brown, Linda Hopkins and Little Milton. The Washington Area Music Association (WAMA) nominated her "Best Blues Vocalist" 2003. WAMA also nominated her CD, "Ruby's Blues" as "Best Blues Recording 2003." Her CD "Ruby's Blues" won The Recording Academy's CD Contest and is currently distributed worldwide. She was a 2002 grant recipient of the DC Commission of Arts and Humanities and a 2003 grant recipient of Jim B.E.A.M. Music. In year 2003, WETA TV, Channel 26 featured her as a Washington DC-based blues artist during the airing of "The Blues" produced by Martin Scorsese. Other 2003 television appearances include Montgomery Community Television and Prince Georges Community Television. Ruby started singing at age 14 leading a gospel choir in her hometown of Plumerville, Arkansas. She toured numerous towns around Arkansas before she moved to Washington, DC in the early 1970's. In Washington, DC she made her professional singing debut at the L'Enfant Plaza Hotel as part of the Al Martinez jazz combo. Later she honed her skills in a rhythm and blues band called the Exclusives and performed in military officers clubs and major hotel ballrooms around the Washington, DC metropolitan area. In 1975 Ruby started her own jazz and blues band and she performed up and down the East Coast from New York to Florida and made television appearances on WJLA, Channel 7, and WDCA, Channel 20 in Washington, DC. Ruby is currently performing in some of the top venues and festivals in the Washington, DC area and around the country (See resume). Ruby is known for her upbeat, interactive performance style. 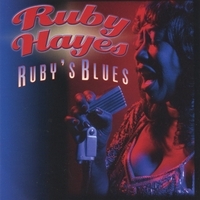 When not performing in the various clubs & festivals, she performs her own original one-woman musical, Ruby Hayes Sings Bessie's Blues at the National Theater, Helen Hayes Gallery, Washington, DC and other venues. Although, she is seen as cool, calm and reserved, when she takes the stage, she's hotter than the month of July. Watch for Ruby, the 'Princess of the Blues', to become a major force in the blues arena!